Mont Alto State Park is a Pennsylvania state park on 24 acres (9.7 ha) in Quincy Township, Franklin County, Pennsylvania in the United States. 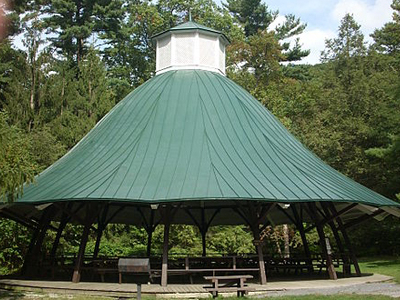 The park is on Pennsylvania Route 233 one mile from Mont Alto.Mont Alto Park became the first "state forest park" in Pennsylvania.The park had a swimming pool, refreshment stand, hiking trails and a carousel. It was also the site of South Mountain Camp Sanitorium. This sanitorium was founded by Dr. Joseph Rothrock, a medical doctor and forester who opened several sanitoriums in the forests of Pennsylvania and became known as the father of forestry in Pennsylvania. The sanitorium treated those afflicted with tuberculosis and other respiratory illnesses. Over the years the park has gradually become less and less of a destination for visitors. It is now a quiet park with minimal facilities. The building that housed the carousel is a reminder of the past which now serves as a picnic pavilion. Here's the our members favorite photos of "State Parks in Pennsylvania". Upload your photo of Mont Alto State Park!